Home / Blog / Winter Paddling – What to Wear? Winter Paddling – What to Wear? What do you wear to go supping in winter? This is a question I get asked a lot! I paddle all year round and love the winter months’ but who wants to freeze on the water let alone get up out of bed! 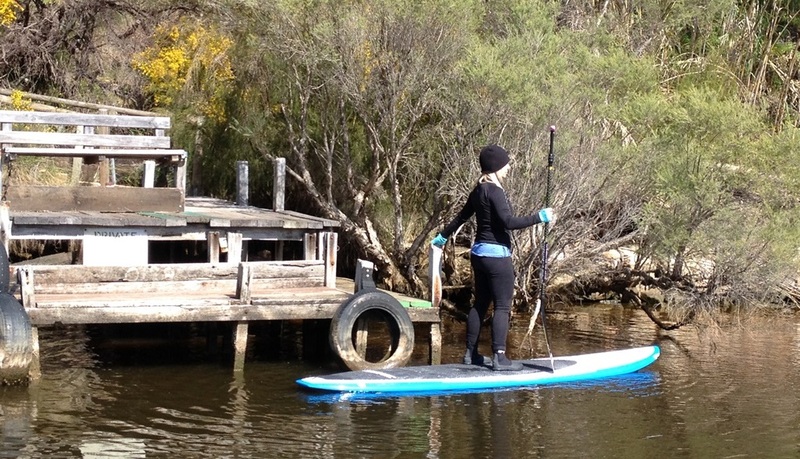 But trust me, some of the most glamour paddles are in winter and it’s a shame to miss out just because it’s cold! Listed below are some essential items to acquire so you can paddle all year round and get mileage out of your sup addiction! Neoprene Booties: I prefer booties that cover the ankles available from surf shops, online or camping stores. Your feet will suffer the cold the most so these are a must. Gloves: Cycling gloves will help to keep your hands warm, reduce callouses, and prevent slipping along the paddle if it rains. Tops: It’s best to layer up. Believe it or not you will get warm and you will need to take something off. Long sleeve T-shirt or rashie and light weight waterproof or semi water proof wind jacket. Wetsuit: I’m not a fan of wearing them for flat water paddling as they can get too hot. If you really suffer the cold try to get a thin two piece suit (2mm) thick. As a two piece you can remove the top and tie around your waist if you start to burn up. Head: Beanies! I love them!! They’re cool and cosy! Ugg Boots: I bought a cheap pair from a department store and keep them in the car. It’s divine to slip your feet into warm uggies after a SUP. Who doesn’t love em! Change of gear: This is an obvious one but try not to forget to bring a change of clothes especially if you’ve planned to go for a pub feed by a cosy warm fire. Wet Clothes Bucket: These are so handy and they are cheap. Keep an empty plastic bucket in the car to throw your wet gear into. Tip: Take a thermos full of warm water to pour over your feet after paddling, It’s the best thing ever! NOT HOT though as you could cause some serious pain pouring hot water onto cold feet. If you’re looking for some winter SUP buddies join our facebook group and paddle out with some of the social crew. If this year is anything like 2017 we’ll have some incredible winter days keeping our SUP Tonic fam busy planning some great paddles.